Here you can find all info about Blue God from Jordan of the Islands. If you are searching for information about Blue God from Jordan of the Islands, check out our Basic Infos, Gallery, Degustation, Strain Reviews, Medicinal Properties, Shop-Finder and Price Comparison, Lineage / Genealogy or Hybrids / Crossbreeds for this cannabis variety here at this page and follow the links to get even more information. If you have any personal experiences with growing or consuming this cannabis variety, please use the upload links to add them to the database! Blue God is a mostly indica variety from Jordan of the Islands and can be cultivated indoors (where the plants will need a flowering time of ±56 days) and outdoors. 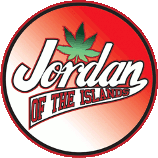 Jordan of the Islands' Blue God is/was never available as feminized seeds. Toker's Bowl Award winning strain! Featured in the Big Book of Buds Extremely bushy plants, dark green with lots of purple colours. Very tasty blueberry god flavour, very potent indica stone. Blue God, the clever name given to the offspring of God Bud and Blueberry, evokes the Hinud deity Krishna-eighth avatar of Vishnu, Bhagvad Gita teacher, master of internal yogas and upholder of the cosmic order. Scholars and priests debate the connotations of Krishna's blue-black skin. It can suggest the profound and peaceful expanse of the sky and sea, and a power distinct from the other gods and heroes. For Jordan's Blue God strain, blue pigment mainly shows its enviable Blueberry parentage. Blue God does well indoors or can grow outside in areas with a long season. It is best to grow the short, dense and bushy Blue God as a multi-branch plant. Jordan prefers gardening this strain in soil over the hydro method. Indoors, Blue God reaches 3-4 feet in height and gets just as wide at the base. 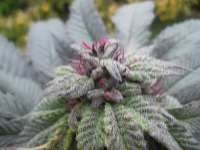 Outside, this solid indica can reach 8-12 feet, crowded with massive buds and thick leaves that turn purple as it matures. Even though Blue God will show incredible resin at 6-7 weeks, wise growers let it go 8 weeks for maximum yields. Blue God gives a very strong indica nightcap high. Sleep and relief from chronic pain can come on fast; the strain doesn't suit activities that require alertness and energy. The smoke tastes somewhat the way the plant looks, deep with a hint of berry. Blue God won 4th place in the Cannabis Culture Toker's Bowl 2002. Height: 3-4 ft indoors, 8-12 out. Yield: 4-8 oz in, 8-16 oz out. 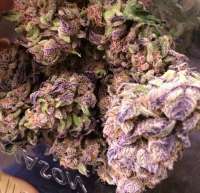 Where to buy Blue God cannabis seeds? Blue God from Jordan of the Islands is available only as regular seeds. Feminized seeds are not available at the moment. In 2 seedbanks, we found 3 offers between USD 44.98 for 10 regular seeds and USD 88.74 for 10 regular seeds. If you are looking to buy Blue God Cannabis Seeds from Jordan of the Islands somewhere - have a look to our Blue God Price Comparison page with all current offers from all the connected seedbanks and shops - or visit one of the following tested, trustworthy and recommended seed-shops directly to check out their current Blue God offers: Oaseeds and myCannapot. We've collected strain info from one grower for Blue God. Blue God gets 8.33 of 10 possible Points in the average! 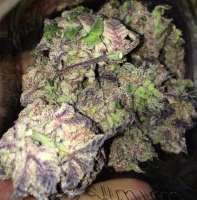 The seedfinder users tested Blue God and uploaded information about the taste and effects of Jordan of the Islands' Blue God. Here a short overview, click to the charts or links to get an exact description and find similar cannabis varieties! Here you see the latest Blue God photos, uploaded from our users! Altogether we've collected 9 pictures from Jordan of the Islands' Blue God, check out our Blue God gallery to view them all. One medical user provided personal experiences about the medicinal values of Blue God from Jordan of the Islands and specially it seem to help with Anorexia and Cachexia, Pain, Psychiatric Symptoms and Dependency and Withdrawal. Please find more information about the medical effects and the dosaging of Jordan of the Islands' Blue God here at our detailed medical info page for this variety. Click to show all parents of Blue God in our dynamic family tree map. Do you know something more about Jordan of the Islands' Blue God? Please help to make this database better and upload/connect your information here! Pictures speak louder than words! Upload your "Blue God" Photos here and help other growers to get a better impression of this variety. You have grown Blue God together with another variety? Please fill out our Strain VS. Strain direct comparisation form! Our strain reviews are multilingual, searchable and can be very detailed - including data about the grow, aroma, effects and taste! Please upload your Blue God Review here to help the other seedfinder users! You have experience with the medical qualities of Blue God? Sharing your information here maybe can help other people! You've stumbled upon a Blue God related thread into a forum or growers community? Connect it here and enable othe users to find this information fast and easy! You found a related video with additional information or grow-infos about Blue God on YouTube? Please connect it here to the strain info page!